Developed in the mid 1990´s by a physical education teacher in the Netherlands “The Rock and Water Program” was implemented in the high schools across the country focusing in a physical-social method of learning and self-control within teenagers. In 2001, Freerk Yketema´s idea was awarded the first prize for the best educational program in Holland. Ykeema´s experience in teaching children lead him to create a program that would assist in reducing the level of sexual violence, crimes and aggression perpetrated by teenage boys. This successful course quickly spread and “Rock and Water” is now widely used in Australia and New Zealand as a tool to avoid social problems like bullying among boys and girls in schools. “Self-control”, “Self-reflection” and “Self-confidence” are “the building blocks of the program and through this foundation young people can understand issues of safety, assertiveness and communication developing an inner compass to find ones own way in a confusing world and find solidarity with others”, explains “The Rock and Water” program guide delivered to the facilitators which are about to join a group of three Senior Program Facilitators and 20 young boys from African countries, Burma and the Philippines. Most of these kids are refugees, some have had very difficult experiences in the past, now they live with their families with the hope of achieving their dreams. "I want to be like Cristiano Ronaldo" says one of the boys, after knowing that I'm Portuguese. - "Messi is better, I want to be like Messi", defies the other. Like any other kid, they are after a better life and they are hope to find it in Australia. 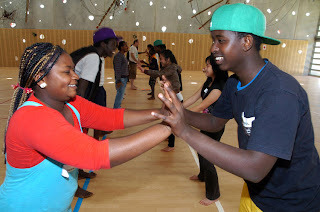 Two days of physical and mental training provided by the Illawarra Multicultural Services(IMS) with lots of extra activities like basketball, table tennis, tennis or soccer were held at the Berry Sport and Recreation Centre, in the Illawarra Region. The camp offers lots of open activities like arching, canoeing, slide or rappel, bushfire and others. The food is provided and the available facilities comprise of a large brick house with boys and girls accommodation, a swimming pool and a vast open area with great sightseeing opportunities and beautiful landscapes. The best experience as a facilitator in this program is when I get to know groups from different backgrounds, and gradually understand their thoughts, their fears and find out in the end that people are all the same no matter what is their culture, their religion, their background. The facilitator should work with those elements in order to relate them to the rock and the water concept. As the “Rock” is the hard element, immovable attitude versus the mobile, communicative “Water” attitude, whether at the physical level, when under attack or the social level, in a conversation, it is possible to choose between a rock or water attitude. At a spiritual level the opposites disappear as insight and fulfilment reveal that both are necessary at appropriate times and that people are connected and can work together. The boys were thrilled about this experience, some of them already had this kind of training before and they believe it is a “good way to control their fears” and to “respect each other”. I found this experience quite interesting specially after knowing these bright kids, eager to learn new things, to enjoy themselves and finally to spend a good time. I offered to become a volunteer first, but I ended as a first time facilitator and as a photographer covering the event for the IMS monthly magazine.